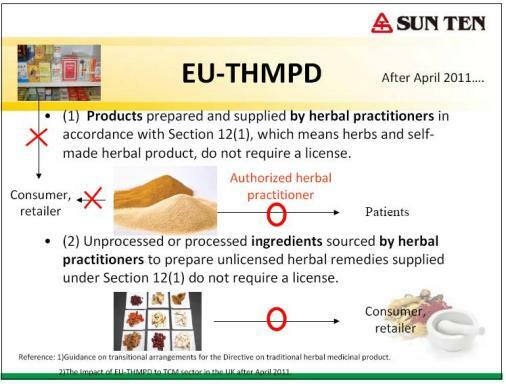 The new laws state traditional herbal remedies must be either licensed or prescribed by registered herbal practitioners in order to comply with a 2004 EU directive, supposedly introduced amid rising concern about the unwanted or adverse effects of some remedies. 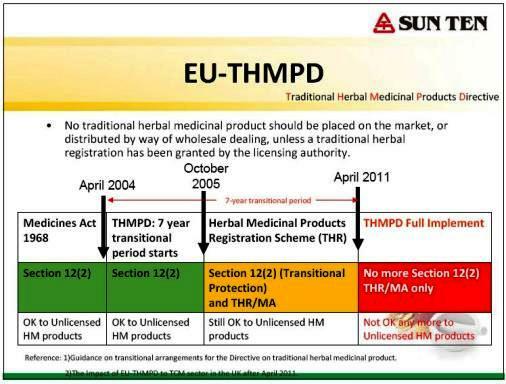 This means patients can only get herbal medicines from an authorized herbal practitioner after 30 April 2011. Only for those products supplied under Section 12(1) therefore do not require a license can be remained on the market. Patients only can get blended herbal extract ingredients from an authorized herbal practitioner, which the authorized herbal practitioner buys in bulk in order to blend to make product tailored to meet the needs individual patients. At presently, in UK, there are around 2500 qualified herbalists and Chinese medicine practitioners. With the enforcement of the regulations and they not being the signatories of the statutory regulation scheme would no longer be able to prescribe a number of herbal medicines. But, practitioners are of the view that the licensing is so expensive that they cannot afford so. In many herbal medicines, a variety of herbs are used and this is the reason their licensing is expensive. As estimated by the Alliance for Natural Health, for each herb, the cost of the license is £100,000. However, herbal practitioners have admonished that suffers may finish up purchasing potentially hazardous supplies from the black market.